Batteries run out – don’t let yours. Bowe’s Exxon Car Care Center carries a wide selection of Deka batteries at the ready in case you find yourself stranded. Car batteries can die for a multitude of reasons – some preventable and some not. If headlights or other power-consuming features are left on while the vehicle is not being operated, the battery may go flat and need a jump from a nearby vehicle. If there is not an accessible vehicle nearby or there is a lack of jumper cables, Bowe’s Exxon Car Care Center is always available to get you and your passengers back on the road as soon as possible. Sometimes batteries die as a result of constant use for a prolonged period of time. This varies depending on the vehicle and battery type. Many modern vehicles come equipped with battery sensors that will alert the operator when it is the optimum time to see a service agent such as Bowe’s Exxon Car Care Center to replace your car battery or simply get it inspected by a reliable expert. Bowe’s Exxon Car Care Center will solve this minor issue in no time – so do not wait until it is too late. A smart car owner knows Bowes. 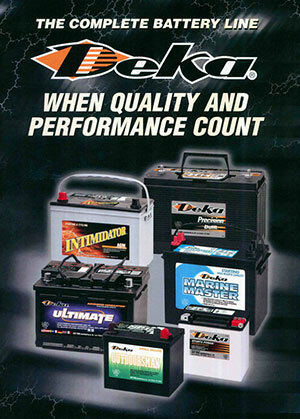 We carry the Deka batteries for cars & trucks. If you need car battery service near the Conshohocken, PA area call Bowe’s Exxon Car Care Center at 610-828-6522.